If you work in independent film production or mobile media recording, then the Zoom F8 is the affordable multitrack field recorder you’ve been waiting for. 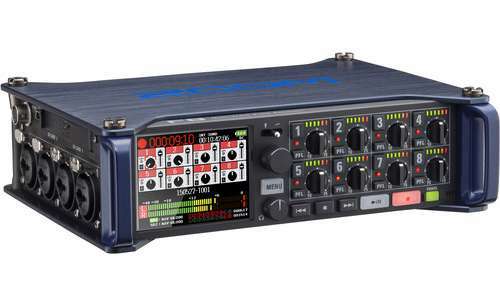 This 8-in/4-out 10-track field recorder offers the professional features you need, such as low-noise microphone pre-ampfliers, timecode in & out compatibility, extensive on board metering, and dual redundant SDXC card recording at up to 24-bit/192kHz. Multiple power sources include internal and external batteries plus AC supply, and the F8 even goes beyond most high-end field recorders with its included a camera-mounting bracket including Bluetooth remote control via free iOS app. With 48 Volt Phantom Powering on all eight channels. These are just a few of the reasons why you should take a very close look at this power pack audio recorder.